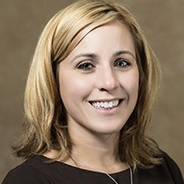 Assistant professor in the University of Pittsburgh’s School of Health and Rehabilitation Sciences Alyson Stover recently received the Occupational Therapy Award of Recognition from the Pennsylvania Occupational Therapy Association. The award recognizes an occupational therapist whose knowledge and expertise have made a significant contribution to the profession of occupational therapy and provides an incentive to contribute to the development and growth of occupational therapy and the association. Stover teaches in the Pitt's Department of Occupational Therapy and the Undergraduate Program in Rehabilitation Science.